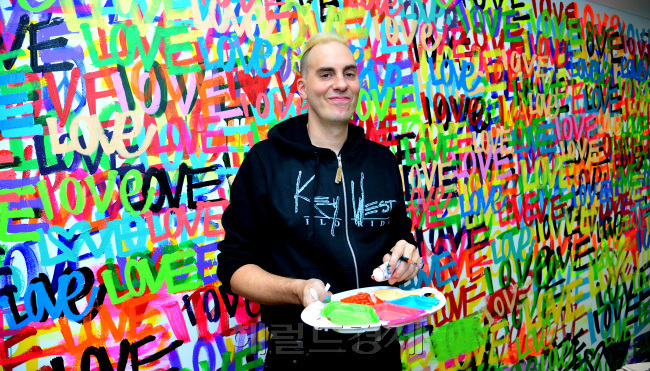 Chris Riggs, an American artist who is carving out a presence around the world with his works full of peace messages, came to Korea this week to speak at the Herald Design Forum 2014 at Dongdaemun Design Plaza in Seoul. 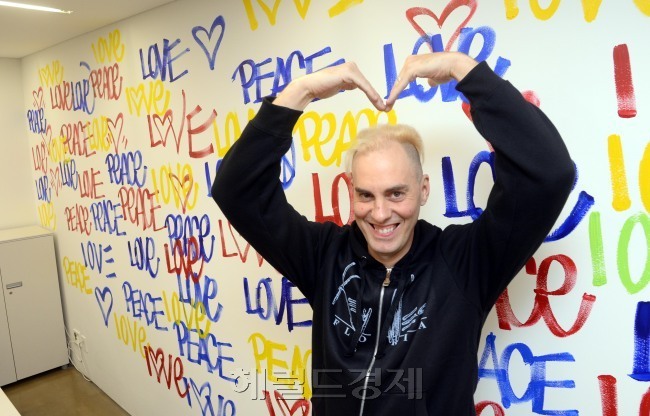 Riggs visited the Herald Corp. building on Thursday to paint an interior wall on the theme of “love and peace,” which has made him an international tour de force to be reckoned with. Riggs also offered some poignant views on the art of community development, space exploration and inter-Korean cooperation. 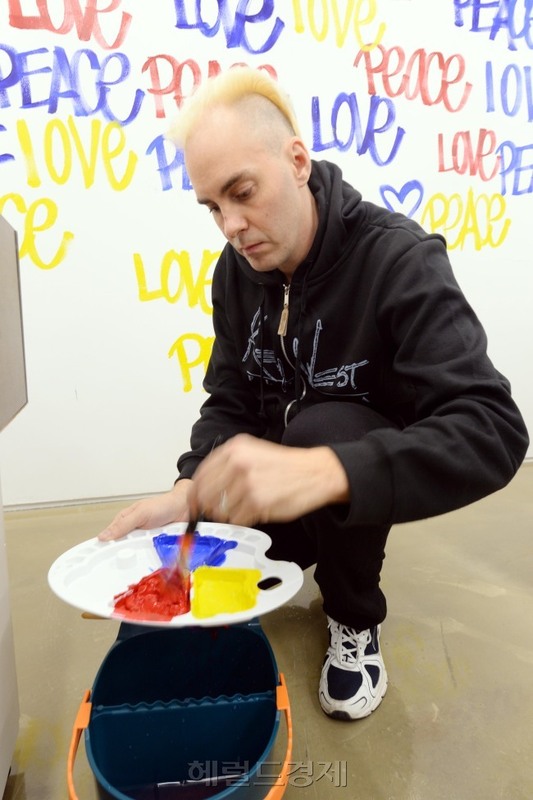 Through his experience working as a financial adviser at a firm in Manhattan during the late 1990s, Riggs said he discovered his true passion in life -- painting his “love and peace” message on walls, canvases, jeans, helmets, Barbie Dolls and tree branches. The 40-year-old artist drew his inspiration from an eclectic mix: urban subcultures, African art, aboriginal art, Pablo Picasso, Jackson Pollock and Andy Warhol. He now works in Miami and New York. His works have gone viral online and been sold to museums, galleries and individuals in more than 50 countries. Riggs is famous for his hallmark creation, “Dunny” -- a black doll with the word “love” painted all over the body in pink, orange and yellow. Riggs’ painting on a wall inside the Herald Corp. building turned into a multicolored, love-filled piece of graffiti after 12 hours of work. Riggs said he will complete the mural when he visits Korea again in January. The artist with a blonde-dyed Mohawk showed his rebellious side when he put up “Chris Riggs for Mayor” posters on Miami and New York’s walls and telephone poles, protesting the cities’ decision to cut funding for lunch programs in public schools. With politicians backed by Wall Street and very little difference between the policies of the Democrats and Republicans, exercising political rights in America is like “eating a McDonalds or Burger King hamburger every day,” Riggs said. Riggs expressed concern over the grave human rights situation in North Korea. He tried to paint a mural in the Demilitarized Zone, but was not given permission by the South Korean government. “South Korean shipbuilding capacity and North Korean space technology can work together to build spaceships rather than nuclear bombs,” he added. Riggs said that he is “afraid of not living, unafraid of dying,” and mentioned art’s potential to revive a city’s sunken economy. Miami’s economy, after being severely hit by the 2008 global financial crisis, is booming again now that it’s hosting the Art Basel international art show, he noted. On his next visit to Korea in January with his wife, Riggs said they will visit the “Ehwa mural town” -- a hillside village in northern Seoul that has become an artsy tourist attraction after getting a mural facelift.